A red 2017 FIAT 500 Pop is being offered as a grand prize to benefit City Lights Art Gallery at 3 E. Army St. in Henderson. 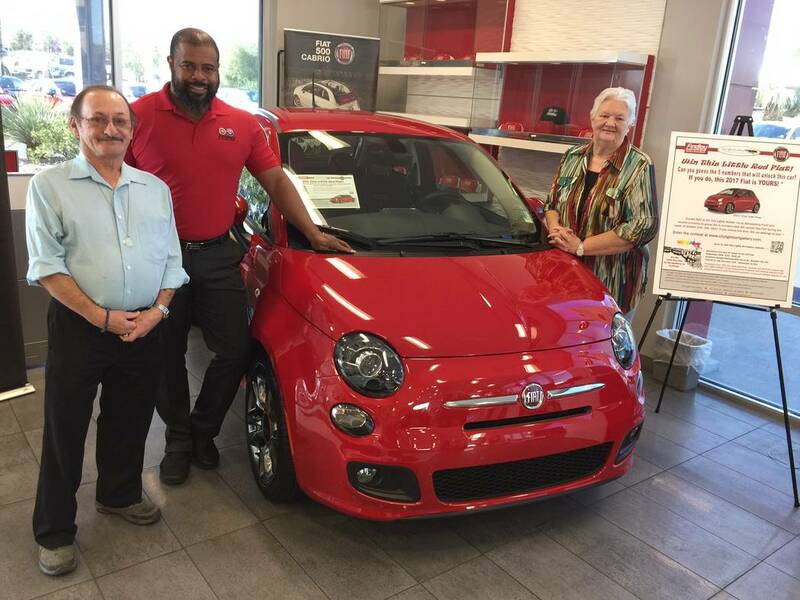 Dubbed “The Little Red Fiat,” the vehicle donated by Findlay Fiat in the Valley Automall is the carrot in a special promotion that will run through Oct 6. Those making a $25 donation to City Lights Art Gallery the City Lights Artists’ Co-op Scholarship Fund will earn the opportunity to pick a five digit number that could lead to someone winning the $17,000 vehicle. Tommy Tucker, president of City Lights Art Gallery, said the promotion has been well-received since it was started Aug. 1. Tucker also mentioned that Findlay Cadillac recently donated $5,000 to City Lights Art Gallery. Also connected to the Little Red Fiat promotion is the Nevada Southern Railway Art Train, which will play host to another fundraiser for City Lights from 5:30-8 p.m. Sept. 30. Twenty artists from City Lights will display their work of four art pieces per artist during the rides and the Little Red Fiat will be showcased on the grounds of Nevada Southern Railway in Boulder City. Both Findlay Fiat and Findlay Cadillac are spearheaded by General Manager John Saksa, who praised the gallery for its dedication to local youth. Further information regarding Findlay Fiat can be found by calling 702-982-4888, going to FindlayFiat.com. On Sept. 29, the Nevada Childhood Cancer Foundation will hold its fundraiser, DUNKtober FEST, at Lovelady Brewery at 20 S. Water St. in Henderson. Sponsored by Lovelady Brewery, the event runs from 6 p.m. to 9 p.m. and tickets are $25 per person. With the purchase of each ticket, guests will receive a souvenir tasting glass and enjoy unlimited access to six unique stations, pairing Lovelady beer with Dunkin Donuts’ munchkins. Guests are invited to bring their own food or purchase food from onsite food vendor Meats Gone Wild. There will be raffles and prizes, too. Proceeds from DUNKtober will be donated to the Nevada Childhood Cancer Foundation’s programs and services to support families and their children suffering from cancer, HIV/AIDS, sickle cell, renal, blood and immunologic diseases, as well as providing wellness and healing arts services for adults diagnosed with cancer. For more information, or to purchase tickets for NCCF’s DUNKtober FEST, call 702-735-8434 or visit www.nvccf.org. America First Credit Union kicks off the season of giving with the launch of its 13th annual Community Food Drive, which runs through Oct. 21. All branch locations throughout Southern Nevada will accept donations of non-perishable food items to distribute to local food pantries and food banks. Since its inception in 2004, the annual Community Food Drive has collected more than 150,000 pounds of food. The latest U.S. Department of Agriculture report states that nearly 16 percent of Nevada and nearly 15 percent of Utah households are food insecure. All collected items will be donated to Three Square Las Vegas and Cappallappa Family Reserve Center in Moapa. This year, the most needed non-perishable food items include, but are not limited to, canned vegetables, canned tuna fish and peanut butter (no glass). To for more information or to find the nearest branch to make a donation, visit www.americafirst.com. The embodiment of culinary talent will converge at the ninth annual Las Vegas Food & Wine Festival and feature celebrity chefs from all over the world. On Oct. 6-7, guests can expect to feast on a sizeable selection of delicious cuisine from renowned chefs, sample award-winning spirits, and simply indulge at the Sandbar Pool area at all-encompassing Red Rock Resort. As with all of Barcelona Enterprises’ events, proceeds will benefit Hurricane Irma relief efforts & The Susan G. Komen Foundation. Headlining the event will be the renowned Chefs Francois Payard and Chef Charlie Palmer, both James Beard Foundation award winners, as well as Chef Brad Kilgore, Food & Wine’s Chef of the year. Additional headlining chefs include Michelin Star Chef Luigi Fineo, Juan Pablo Colubri, Saipin Chutina, Sean Kinoshita and Kang Kuan. Some of these talented individuals will further display their expertise by performing exciting, live demonstrations of culinary art. Tickets for Friday and Saturday are now on sale. General Admission is $100 for each day and the food and wine tastings begin at 9 p.m., while VIP experience is $150 per day and begins at 8 p.m. Cabana tickets, which include 10 VIP passes, two bottles of vodka and a private cabana attendant are available for Friday and Saturday dates. Tickets include a special tasting of world-class wines, beers, spirits and delicious food, while helping raise money for a meaningful purpose. For more information and to purchase tickets, visit VegasFoodandWine.com. Former lead guitarist from The Eagles, Don Felder, will be joining the stage with talented Southern Nevada medical community members this fall to raise funds for the nonprofit Nathan Adelson Hospice. Felder will perform his popular hits during the “Serenades of Life — Doctors in Concert” event, Oct. 20. The event, presented by Bill and Susan Walters, will begin at 6:45 p.m. at The Smith Center for the Performing Arts, with doors opening at 6:15 p.m. Ticket prices vary from $39 to $175 per person. To purchase tickets, call The Smith Center Box Office at 702-749-2000 or visit the website at www.thesmithcenter.com. More information is also available by calling Stephanie Forbes at Nathan Adelson Hospice at 702-938-3910. In addition to Don Felder, other performers will include: Alan Arnold, M.D. ; Linda Woodson, M.D. ; Nancy Hsiao, M.D. ; and Alter’d Ego band members David Miller, M.D., Ken Woloson, Esq., Phronsie Markin, Larry Tindall, Doug Kralowetz, Tim Mendoza, along with featured guests Ed Kingsley, M.D., Ira Spector, and June Sigman, M.D. Musical numbers will range from soul to rock‘n’roll to pop. Proceeds from the concert support The Bonnie Schreck Memorial Complementary Therapies program at Nathan Adelson Hospice. The program improves the quality of life for the hospice’s patients and loved ones and eases emotional and physical discomfort. Patients and their loved ones may request various therapies such as pet therapy, reiki energy work, message therapy, art therapy, reflexology and aromatherapy. News 3 Las Vegas anchor Dana Wagner will serve as master of ceremonies, with a special appearance by actor/comedian Brad Garrett. Kelly LeGrow of Brown and Brown Insurance of Nevada will also receive the annual Brad Garrett Humanitarian Award at the event. The Delta Dental Community Care Foundation has awarded a $10,000 grant to Volunteers in Medicine of Southern Nevada to help improve access to oral health. The Delta Dental Community Care Foundation is the philanthropic arm of Delta Dental Insurance Company and its affiliated companies, which provides dental insurance to nearly 36.5 million people, including 95,000 in Nevada. The grant will aid in the purchase of consumable and non-consumable dental supplies in order to service increasing numbers of dental patients. “Quality dental care is crucial to overall health, and Delta Dental’s incredibly generous donation will allow Volunteers in Medicine of Southern Nevada to ultimately treat more Southern Nevadans in need,” said Dr. Florence Jameson, VMSN’s founder and president. One hundred percent of Volunteers in Medicine of Southern Nevada’s patients are medically underserved, low-income residents of Southern Nevada. The clinic has a growing network of volunteer medical/nonmedical staff who together donate more than 45,000 hours per year. This summer marked the 10th year that Terry Fator has been performing for audiences around the world as the winner of Season 2 of A”merica’s Got Talent.” The entertainer and Las Vegas resident marked the anniversary in a very special way — launching the Terry Fator Foundation. Since winning America’s Got Talent in 2007, Terry has been a continuous supporter of many charities ranging from military focused organizations including Airpower Foundation and Snowball Express, to the Arthritis Foundation, in which Terry has a family connection. As most fans know, 100 percent of profits from Terry’s merchandise sales at The Mirage performances in Las Vegas, his out-of-state touring shows throughout the year, and even purchases made at the Terry Fator online store, benefit multiple military charities. The foundation (currently pending it’s 501(c)(3) status), along with its online home www.TerryFatorFoundation.com, gives Fator fans a way to participate by traveling along this philanthropic journey with the entertainer: Whether they wish to follow him as the site is updated with his tales of giving back, charity spotlights, and highlights from the foundation’s donations, appearances, and events; or once the tax-exempt status is complete, simply donate directly to the foundation to, in turn, help others. Las Vegas’ most prominent entertainers will take the stage at Las Vegas’ seventh annual NF Hope Concert on Oct. 22 at 1 p.m. at The Palazzo Las Vegas. Benefit organizer, Jeff Leibow, formerly of “Jersey Boys,” has once again united the entertainment community bringing together a who’s who of Las Vegas performers, including Clint Holmes, Human Nature’s Andrew Tierney and The Tenors of Rock to raise money and awareness for the Neurofibromatosis Network, an organization dedicated to families and individuals suffering from neurofibromatosis (NF), and the Nevada Childhood Cancer Foundation to support NF families in Southern Nevada. Tickets start at $45 and can be purchased at any box office at The Venetian or the Palazzo, online at palazzo.com, or by calling 702-414-9000 or 866-641-7469. A limited number of VIP tickets are available by emailing info@nfhope.org. Since the inaugural event in 2011, the NF Hope Concert has raised just shy of $500,000 for neurofibromatosis research and advocacy. This year’s all-star lineup includes the Las Vegas debut of Finding Faith, featuring Andrew Tierney of Human Nature; award-winning Vegas headliner Clint Holmes and wife Kelly Clinton; The Space founder and “Magic Mike Live” star Mark Shunock with wife, Cheryl Daro; stars of “World’s Greatest Rock Show” at the Stratosphere; These Guys Worldwide; comedy-magician Murray Sawchuck; The Tenors of Rock, Jeff and Melody Leibow with a special guest appearance by daughter, Emma; as well as some surprise guests. A full list of confirmed guests will be announced closer to the event. neurofibromatosis (NF) is a genetic disorder of the nervous system characterized by tumors that can grow on any nerve in the body without warning. Leibow’s young daughter, Emma, was diagnosed with this condition in 2010 when she was 9 months old. As Leibow and his wife, Melody, learned more about the disorder’s devastating effects, they conceived the idea for the concert with the realization that they had an obligation to both their family and the 128,000 people living with NF to educate others about the disorder. Although it is a common genetic disorder, most people are not aware that one in 2,500 people are born with it making it more common than cystic fibrosis, hereditary muscular dystrophy, Huntington’s disease, and Tay Sachs combined. Tickets start at $45 and can be purchased at any box office at The Venetian or the Palazzo, online at palazzo.com, or by calling 702-414-9000 or 866-641-7469. A select number of VIP tickets are available. VIP tickets include access to a private wine and dessert reception (with a special performance by Las Vegas’ biggest headliners) and prime seating at the Oct. 22 concert and are available by emailing info@nfhope.org. The NF Hope Concert also features a silent auction including priceless experiences, ticket packages to the top shows on the Strip, hotel stay packages, restaurant gift certificates and spa experiences.